"The SS Hilda is a nice wreck within reach of experienced divers"
Of all the unlikely places in the world that I thought I would ever dive, this site would have to be the winner. How I got to dive here is a story in itself, but the simple version is that I was asked to be the expert witness in the Gabe Watson murder trial (click here to read more) which was on in Birmingham, Alabama, USA, in February 2012. While there, I decided I wanted to dive this quarry. Why? Well, both Gabe and his wife, Tina (who Gabe was on trial for murdering) were trained here. 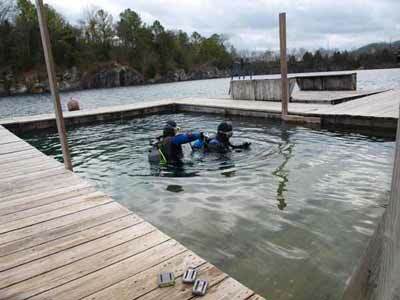 Gabe also did the vast majority of his dives in the quarry as well as all the training for his various certifications. 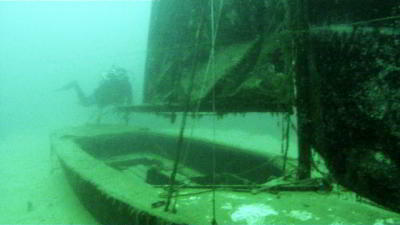 This site used to be called Alabama Blue Water Adventures and is now called Dive Alabama. 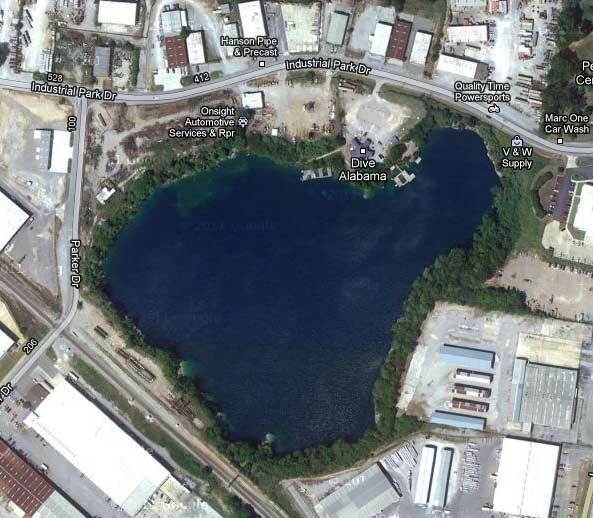 The site is more commonly called Blue Water Quarry and also used to be called Pelham Keys. It is an old limestone quarry that flooded when the quarrying hit an underground stream. 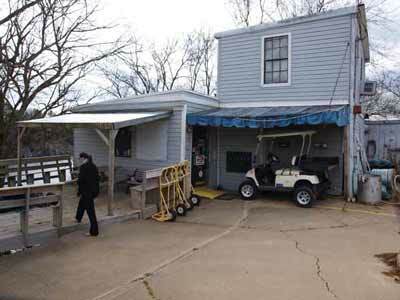 It covers an area of about 10.5 hectares (425 by 350 metres). The reason I wanted to dive the quarry was that I was to appear as the expert dive witness for the defence in Gabe's trial. 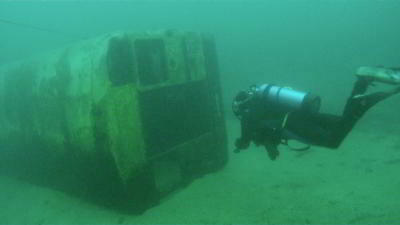 I wanted to experience the site so I would be better able to make a comment on the suitability of it in preparing a diver for diving in the open ocean, especially at a site as difficult as the SS Yongala where Tina died. On Wednesday 22 February 2012 my wife Kelly and I travelled from central Birmingham out to Pelham to dive the quarry. 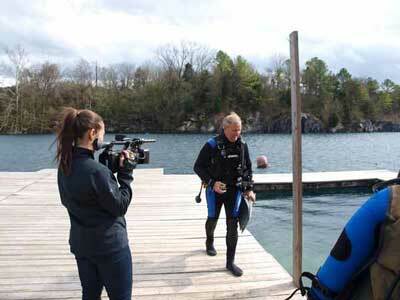 We were accompanied by Nikki Battiste, a producer with the US ABC 20/20 program who was going to video me diving here. We were going to use our GoPro camera to video the underwater adventure and provide this to Nikki to use in the program on the trial. When we arrived there, Peter Patrick from The Age newspaper in Melbourne was waiting for us. He introduced us to the former owner and the current manager. Apart from a couple of items like computer and masks and Kelly's wetsuit, we had to hire everything. We picked out our gear and set about getting ready. 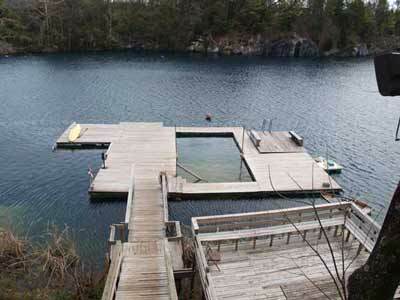 Once geared up it is a short but steep walk down a set of stairs to the platforms that provide easy access to the water. Nikki videoed us as we get ready as she hopes to use the footage to accompany a long interview the anchor of the 20/20 show has already done with me. The water is cool, but not as cold as I thought it would be. The top is possibly 15°. The training pools have a bottom where you can stand up and then over towards the quarry itself it drops away to about two metres where there is another floor. We start to descend but I discover I do not have enough weight. I grab a couple of the additional weights I bought down to the water's edge. That is the problem using hire gear and diving in an environment (freshwater) that I have only ever dived in a few times before. Once under the water, we head out and see the rope coming from a buoy. This leads to a car. From here there is a line heading to the south-east. This leads across to a small sailing boat. As we go we descend to about 25 metres. We are swimming along a sort of ridge, with the bottom a bit deeper either side. It looks like it may have been a road before the quarry flooded. The water temperature down here is a chilly 13°, much colder than the normal winter water temperature back home in Sydney. The visibility is pretty good, over 10 metres and perhaps 15 metres in spots. Hanging off the line is a dinosaur. Then we come to the boat, with the sail fully up. From here there is line that goes further south-east and to an old yellow school bus. This is laying on its left side. You can swim in the back and out the front door, although there are other places to exit including a large hole cut in the roof just behind the driver's seat. We have decided to follow the eastern edge of the quarry back to the north. We can see the sheer wall of the quarry on our right. We come to what appears to be a shipping container. We continue and then come to a car and next to it a series of very large concrete pipes. You can swim through the pipes easily. It is a short run back to where we started. We head south-west and pass another car and the training platforms. 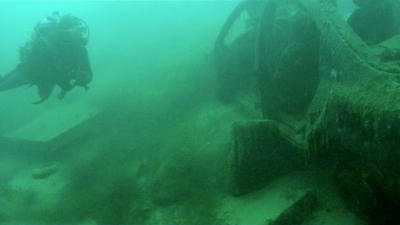 There is also an underwater platform at five metres a bit off the main ones. We continue past the platforms and see a satellite dish and then a car and a bit further on, a VW Beetle. 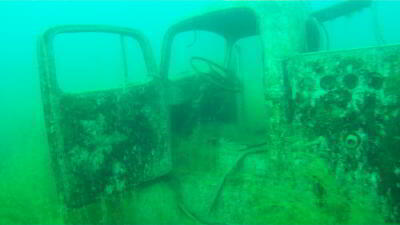 We continue at this shallower depth and around to the west and north-west there is an old truck. We head back to the platform and then do a safety stop on the five metre platform. All through the dive there have been fish around, but now there are quite a lot. There are some large catfish here and other species that I do not know. We swim back to the spot where we entered and come back up onto the platform. It has been a very interesting dive and worth doing. I have achieved my aim, this is one of the easiest dives I have ever done, no current, no wave action, no surge, no dangerous animals. 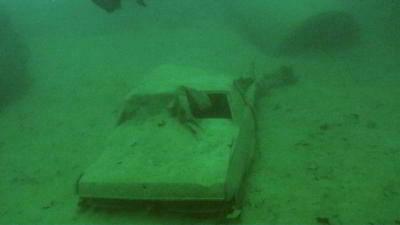 It is certainly not a dive that gives a novice diver any sort of experience that would help them to dive in the ocean. NOTE: Underwater photos taken from GoPro video footage. 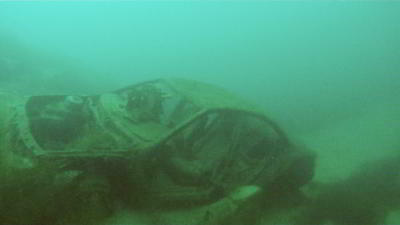 Below is a video that Kelly put together of our dive in the quarry.